Tadi Brothers’ 9" Split Screen Mirror for up to 3 Backup Cameras is the perfect tool for any driver who needs backup assistance. This thin, color, LCD mirror monitor is light and well equipped with four video inputs to make driving easier and allow you to input multiple cameras, game systems, or DVD players. Crystal clear images can be viewed one at a time from each input or all at once in a split screen mode. This mirror monitor is compatible with any make or model of vehicle and can connect to any power source, including cigarette lighters. This backup monitor clips over your existing rearview mirror for ease of installation. Our large 9" Split Screen Mirror for up to 3 Backup Cameras is easily visible from any angle. Purchase up to three backup cameras from Tadi Brothers’ online store to complete your package. And don’t worry about cable- this system comes with a 15 foot cable for up to an SUV sized vehicle. 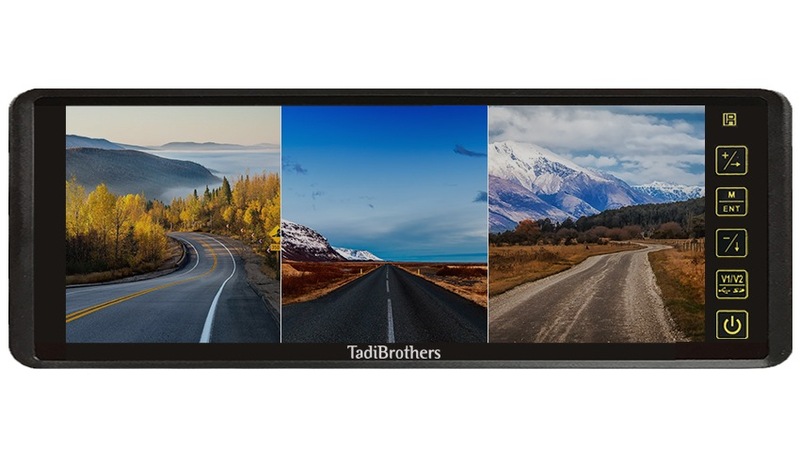 Feel free to mix and match cameras, monitors, and DVD players purchased from Tadi Brothers online with your 9" Split Screen Mirror for up to 3 Backup Cameras for a driving experience that is uniquely you. Ask us about other options if you drive a larger vehicle or have security monitoring needs; we offer 4-8 camera split-screen monitors as well! We offer world-class products and stand by them with a 24/7 technical team for any questions you may have. If you need to return your 9" Split Screen Mirror for up to 3 Backup Cameras, Tadi Brothers offers a 100% money back guarantee for 60 days.